The Education and Academies Bill began its passage through Parliament, with Second Reading on 22 June and Committee stage commencing on 30 June. The Bill aims to expedite the process of converting struggling schools into academies. One of the most controversial proposals is the removal of parents’ right to be consulted. Research on the impact of parliamentary select committees on government has been published by the Institute for Government. The Institute for Government has also published a series of blog posts on select committees, including one on the election of committee chairs. The post examines the committees newly established – for Women and Equalities and for Petitions – and the changes to existing ones. The Public Administration Select Committee (PASC) has been abolished, and its remit combined with the Political and Constitutional Reform Committee to form the Public Administration and Constitutional Affairs Committee. The Future of the Human Rights Act was the subject of a Westminster Hall debate on 30 June. Responding to the debate, the Minister, Dominic Raab, explained that there would be a formal consultation in this parliamentary Session, including with the devolved administrations, before any legislation was brought forward to replace the Human Rights Act. Withdrawal from the European Convention on Human Rights is not the Government’s objective, but no option has been ruled out. The High Court has held that delays in assessment for individuals claiming Personal Independence Payments (PIPs) on account of disability were unlawful. PIPs replaced the Disability Living Allowance (DLA). The claim was brought on behalf of two individuals who had waited for 10 and 13 months respectively before they were assessed as entitled to PIP. The Court held that the delays were unlawful on the grounds of a breach of the implied duty to determine PIP claims within a reasonable time. However, there was held to be no breach of the claimants’ human rights under Article 6 or Article 1 of Protocol 1 of the European Convention on Human Rights. The Court of Appeal has upheld a decision of the High Court to award compensation to two women who were sexually assaulted by John Worboys. Rejecting the appeal brought by the Metropolitan Police, the Court held that the judge had been right to find a violation of Article 3 as a result of the failure to conduct effective investigations into the assaults. The Supreme Court has ruled that police can publish images of children suspected of being involved in causing criminal damage or riots. The publication of images of a 14-year-old boy apparently committing public order offences did not violate his rights under Article 8 because he had no reasonable expectation of privacy in the circumstances. The European Court of Human Rights has ruled that adverse media coverage did not prejudice the outcome of proceedings in the UK against a suspect in a terrorist plot to cause explosions on an aircraft. 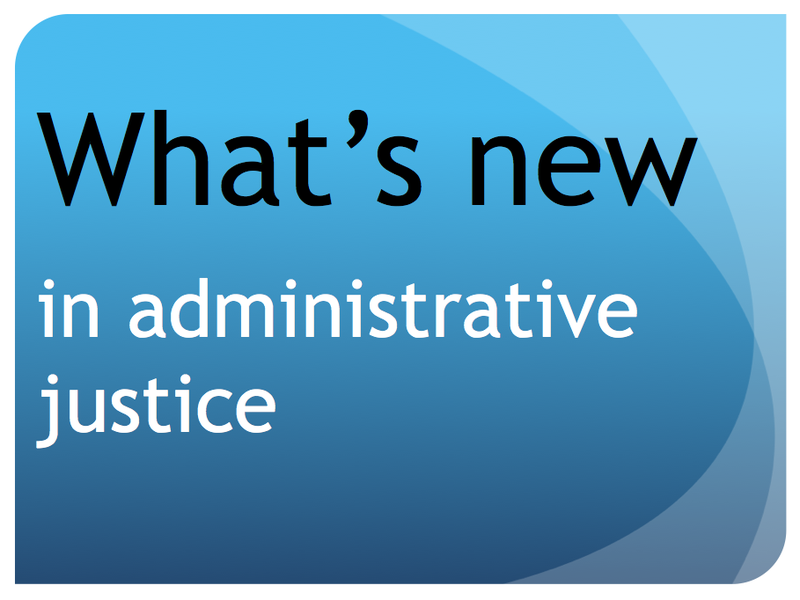 The Ministry of Justice has published the latest quarterly statistics on legal aid, and tribunals. The Ministry of Justice has announced the terms of reference for a review of the introduction of fees in the employment tribunal, setting out the types of evidence to be considered. The review is expected to be completed later this year. The National Audit Office has published a report on lessons learned from the Department of Work and Pensions’ implementation of welfare reforms, and another on the difficulties with public services redress systems. The Equality and Human Rights Commission has published its submission to the UN Special Rapporteur on Disabled People, setting out evidence of the impact of the UK Government’s justice and welfare reforms on disabled people. The House of Commons Library has published a Briefing Paper: Judicial Review: Government reforms in the 2010-15 Parliament. Julie Mellor, the Parliamentary and Health Service Ombudsman, has announced she will step down when the Public Services Ombudsman Bill receives royal assent. The Local Government Ombudsman has published a Review of Local Government Complaints 2014/15. The report found that the Local Authority complaints system is under pressure due to an increase in complaints and a decrease in resources for handling them. Education and children’s services is the most complained about area, while there has been an increase in complaints about adult social care, and a decrease in complaints about tax and benefits. The final regulations to implement the EU ADR Directive for consumer redress have been published, together with detailed guidance on requirements for businesses to comply with the Directive. The Secretary of State for Justice, Michael Gove, made a statement to the House of Commons on the next steps for the criminal legal aid budget. He confirmed the Government’s intention to press ahead with a further 8.75% reduction in litigators’ fees, and to proceed with the new duty provider contracts. However, advocacy fees will not be reduced at this stage; alternative ways of securing savings through greater efficiencies will be explored instead. An independent review will be undertaken to assess the impact of the changes on access to justice and the quality of litigation and advocacy provision. « Are we about to see an era of experimental government?